Annual retail gas prices since 1950, split by Leaded and Unleaded and adjusted for inflation. 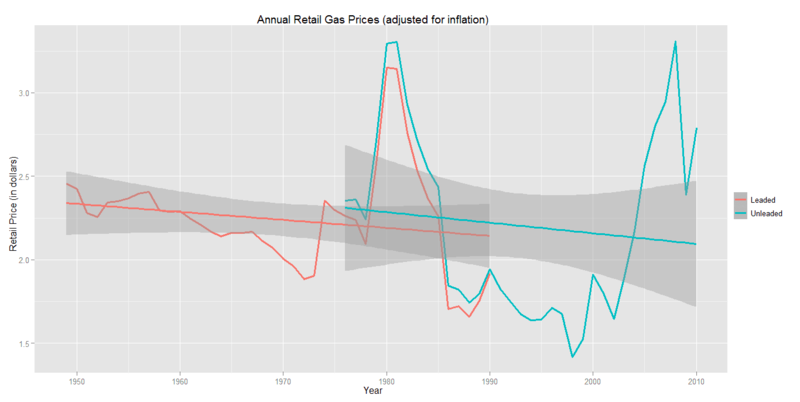 Gas prices have spiked sharply twice since 1949. Even though $3 per gallon sounds like a lot, when adjusted for inflation, it isn't that bad when compared with some prior years. Both trend lines indicate that gas is getting cheaper over time; however, due to the wildly fluctuating prices of unleaded since just before 1980, the 'least squares' method of determining the trend line is problematic. Why were the prices for leaded gasoline more stable than unleaded? Are we due for a major downward trend in prices? Is the amount of fuel consumption related to the retail price?